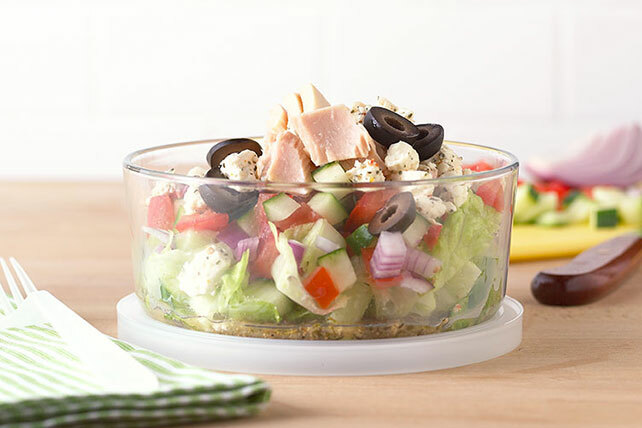 This HEALTHY LIVING chopped salad is ready to eat on the go, made with tuna, feta and the classic Greek veggie trio of tomatoes, cucumbers and red onions. Substitute shredded cooked chicken breast or drained canned garbanzo beans for the tuna. Salad can be stored in refrigerator up to 24 hours before serving. Prepare using KRAFT Greek Vinaigrette Dressing.